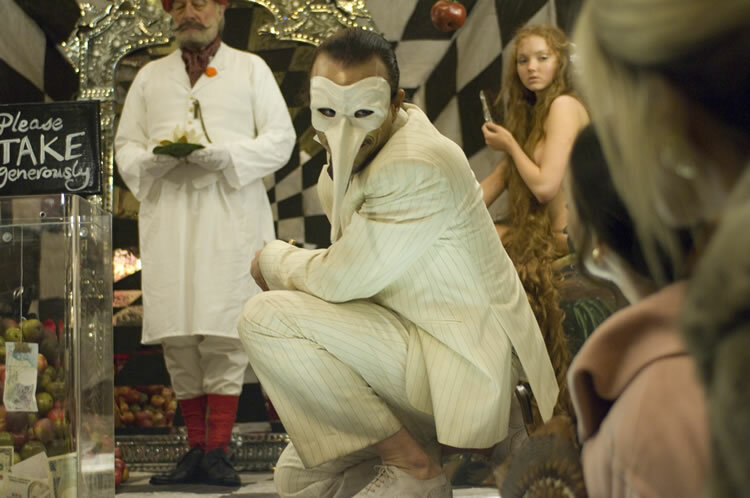 I finally got around to seeing the film The Imaginarium of Doctor Parnassus. I was feeling a little down the night I saw it, but it’s one of those movies that helps me feel better about life again. It was a great ride, full of wonder, mystery, redemption and beauty. Terry Gilliam has long been one of my favourite filmmakers. Images from his film Brazil and his animation work with Monty Python hold a special place in my imagination and memory. So, when I heard a new film was coming out that he directed, I was really looking forward to it! And, he did not disappoint! The always visually stunning Gilliam has made another great film, in my opinion. It’s very beautiful and moving; a tale of good versus evil and the power of the imagination. Several times during the film I sat back in rapturous awe of Gilliam’s stunning visual storytelling. The sets, costumes, design, themes, pacing, and feel of his work is amazing! 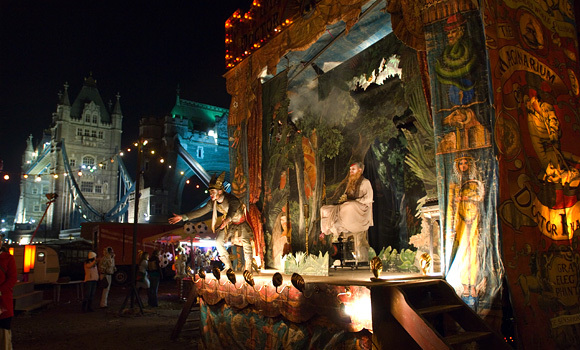 The part where the Imaginarium wagon (with open air deck) is drawn through the city streets provided an immediate contrast between two worlds – the world of commerce, the workaday world with it’s hard lined buildings, cold light and glass – and the world of the Imaginarium with it’s costumed, dreamy inhabitants, ragtag, but rich in colour, depth, and emotion. It’s not until later in the film where the thematic echo set up here: that of an open-air boat traveling through a landscape is revealed (and I won’t reveal it further for those who have not seen the film). The film was in great danger of not being completed. One of the stars of the film, Heath Ledger, died during production. Other actors were brought in to reprise Ledger’s role: Johnny Depp, Jude Law, and Colin Farrell. It was possible to weave the others actors into the role, as the scenes still needing to be filmed where those taking place inside the imaginary world of the Imaginarium. So, luckily, some creative license was possible to explain the changes in the look of the character. I think the fact that they were able to finish that film and still have it work, makes the film even more magical. The film was dedicated to Ledger. I was very pleasantly surprised to find Tom Waits in the film in a starring role! I’m a fan of his music and he’s a great actor as well. He was well cast for his part, bringing his unique style of deadpan humour, gravatas and fortitude to the role, one which required a contolled menace (which I’m not going to reveal, as I don’t want to spoil your fun if you’ve not seen it). I thought all of the actors were great, including the disguinished Christopher Plummer as Doctor Parnassus, the talented young co-stars Lily Cole and Andrew Garfield, and the always engaging Verne Troyer. The computer animation used in the film was some of the most effective I’ve seen. It’s no real surprise, coming from a film that Gilliam directed, that the visual effects were top rate. I liked how well the computer animation blended with the live action. Much of the animation is breathtakingly original and fun. I loved the “space jellyfish” and many other great moments of animation inisde the Imaginarium! This film is a must buy on DVD as far as I’m concerned and I can’t wait to see what extras it will come with. Coming soon is Gilliam’s second attempt at filming The Man Who Killed Don Quixote and I wish him luck.